David Zeligman (SJD) is CSLR’s Herman Dooyeweerd Fellow in Law and Religion for the 2018-2019 academic year. The fellowship honors the distinguished 20th-century Dutch jurist, theologian, and philosopher Herman Dooyeweerd and is awarded to an Emory Law School student who shows promise for academic and scholarly excellence. 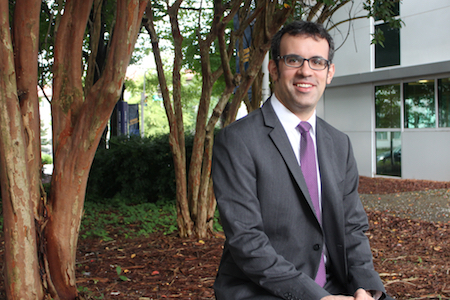 Zeligman arrived at Emory Law in 2017 by way of Toronto, where he earned his LLM and JD from the University of Toronto. While working in private practice in Toronto, he encountered occasional questions related to his work and his Jewish faith. For example, Jewish law addresses wills and inheritance, and if a client is Jewish, is there a way to address Jewish law and secular law? If your client isn’t Jewish, but you are Jewish, do you need to address matters of Jewish law? Should lawyers disclose their religion to their clients? Are there cases a religious lawyer should decline on religious grounds? If you know the client has the same religious view, can you propose looking at the case differently? As he researched the issues, he became fascinated by religious lawyers and how religion affects their work. He thought it would make a compelling topic for an SJD dissertation, and CSLR Director John Witte, Jr. agreed.